As I looked over the reinforcement schedule prior to playing, I saw that eighteen Ju-52 transports were withdrawn early, but I mistakenly thought it was on turn 3. It’s not. Here on turn 2, the Ju-52s are withdrawn, leaving 12 air units behind. This could cause a problem for the Germans. Air reinforcements arrive for the Germans in the form of Ju-87R dive bombers, Me-109Es and more Me-110Cs. The two naval battles at Narvik (April 10 & April 13, 1940) have been fought to an Allied victory. The Germans receive the stranded Kriegsmarine sailors as reinforcements this turn. The priorities for the Germans now are to break out from Oslo, and get supplies to Norway. Getting supplies to Norway may indeed prove much more difficult since the bulk of transports has been withdrawn. The Norwegians gain two more artillery units at centers 1 and 2 near Oslo, but number 3 has been captured by the Germans at Trondheim, gaining the Germans an artillery battalion. The Norwegian artillery crews assemble outside of Trondheim as an infantry battalion, further attempting to seal off the German invaders. The German supply depot arrives in Sweden on the Norwegian border as scheduled. Instead of printing supply depots as had been done with the GDW version of the game, resource point markers are used. A marker with a 1 denotes a captured depot, while a marker with a 2 denotes a regular supply depot. The distinction is that captured supply depots (depots captured from the Allies) can’t be used to provide attack supply, though it may provide general supply, and is thus never expended. The supply situation is far from critical at this moment, but getting pretty dire. 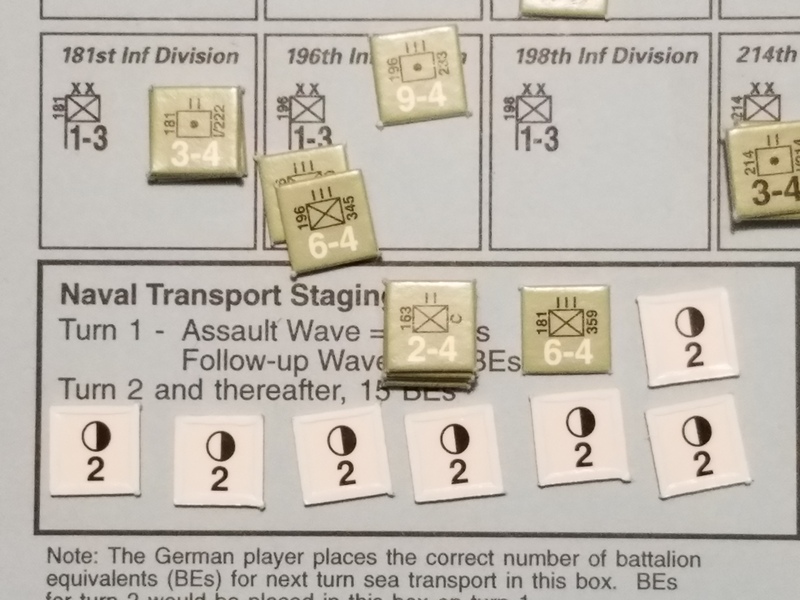 While being out of supply on this turn has no effect on defensive capabilities, German units cannot attack without supply. Fourteen and 1/3 battalion equivalents (the 1/3 being a company of Panzers) are shipped to Oslofjord. Of these, two battalions are sunk in transit, including a battalion of mountain artillery. This scores an additional 5 victory points for the Allies. Surviving units are landed all along the Oslofjord, including follow up landings at Horten, Halden, Tonsberg and Fredrikstad. Whilst these landings are taking place, the staging box is filled once again. 8 supply depots are staged, with 7 battalions of infantry loaded onto the ships. 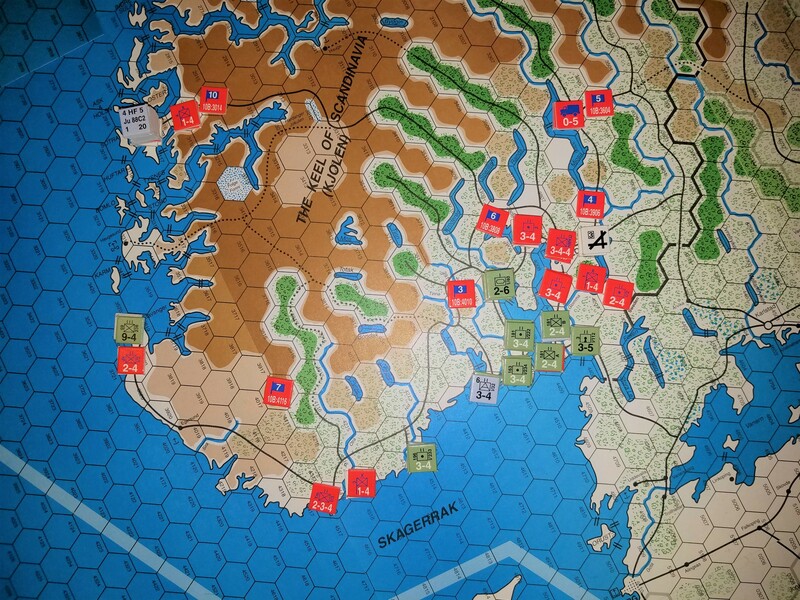 The Germans begin to move quickly, capturing Mobilization Centers 1, 3 and 6 (having already captured #8 at Stavanger, #9 at Bergen, #12 at Trondheim, and #15 at Narvik). That’s 7 out of the 16. One of the unique things about the Narvik rules is that it seems that anyone can use the railways, no matter if they belong to the enemy or not. The reinforcements that have landed this turn jump on the trains and swing around Oslo to the west, and tighten the vice on Fornebu Air Station, assaulting the defenders there while tanks push north and attack the airfield. Forces from the Arendal landings race west and seal off Kristiansand and Kjevik Air Station, while other troops ride the rails towards Mobilization Center 7. While working on the picture, I noticed that Mob Center 7 is in the wrong hex, meaning it has been captured by the German AA battalion. That makes half of the Mob Centers under German control. Transports from Germany fly supplies to the area, preparing to air drop the depots for use in the attacks. Parachute air drops are also planned from Bergen, since weather is no longer a factor. Air drops are considered for the Norwegian trucks, Gardermoen Air Station and Mobilization Centers 4 & 5. All of these targets are within interception range of the British Skuas at Værnes Air Station, and the Germans do not have enough escorts in Norway to protect them all. The risks are considered too great, so the paratroopers are to drop onto Gardermoen Air Station, to be reinforced by Panzers during the exploitation phase. The transports are escorted by the Ju-88C heavy fighters out of Bergen. Supply transports are escorted by Me-110Cs flying out of Aalborg, Denmark. Most of the bombers flying from Germany target Værnes Air Station to shut it down. 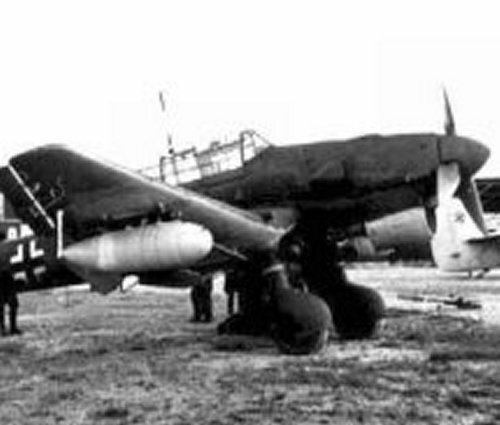 A total of 20 air units, Ju-88s and He-111s, fly to the airbase. Remaining bombers target the Oslo area to disrupt rail transport out of the city. The British carefully consider the situation, and determine to send the Skuas against the supply transports dropping closest to Oslo, which are being escorted by an Me-110C. The Germans cannot attack if their supply is disrupted. The Skuas prove to be much more nimble that the Me-110s, shooting the Messerschmitts down and attacking the transports themselves. The Skuas must have used all their ammunition to shoot down the Messerschmitts, because the transports complete their mission unscathed. The bombers neutralize Værnes Air Station with little problem, scoring 2 hits out of 4 attempts. The Gladiator fighters chose not to intercept because doing so would be suicide. The neutralization of the airfield means the Skuas must find somewhere else to land. Sumburgh is out of range, so the Skuas are forced to land at Sola Air Station outside of Stavanger. The bombing runs to destroy rail lines around Oslo fail to inflict any damage. Parachute troops land on Gardermoen Air Station and capture the airfield. German air units may now begin to land at the airfield. One parachute company pushed northeast after the landing to take control of Mobilization Center 4. That’s 9 of the 16 mobilization centers captured by the Germans. I don’t think I have ever captured over half of the mobilization centers by the end of the second turn. While transports return to Germany, many of the shorter range bombers (He-111Hs) along with a couple of fighters land at Gardermoen. The Luftwaffe is starting to arrive in force into Norway. The German supply drops were successful. General supply is replenished for all units except those at Trondheim, Bergen , Stavanger and all units on the east side of the Oslofjord. The Norwegians now attempt to retreat prior to combat resolution at the three points of attack (Fornebu, Kjevik & Kristiansand). Only the artillery at Fornebu succeeds in retreating, pulling back into Oslo As the attacking artillery and tanks interdicted the hexside they attacked across. 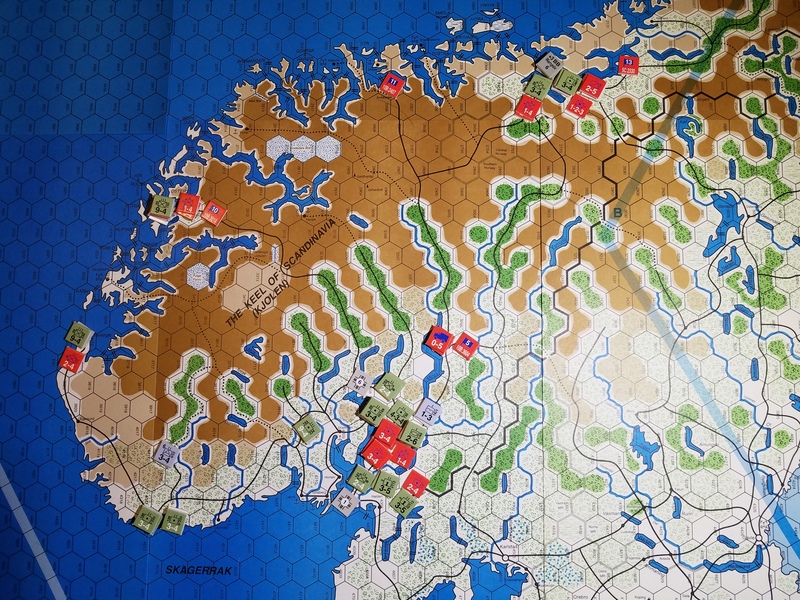 Fornebu and Kristiansand fall to the Germans as the defending Norwegian battalions are eliminated. The Norwegian 3rd Brigade HQ holds Kjevik Air Station, withstanding the artillery shelling unleashed upon it. Following up, the Panzer company advances to Gardermoen to reinforce the two parachute companies holding the airfield, sealing off Oslo. Gardermoen and Fornebu airfields have fallen. Værnes Air Station has been neutralized for this turn. Oslo is now surrounded. I think this is the fastest I have ever accomplished all of this. Falling under the “Know your own forces” heading, I discovered this turn that the He-115 Bombers can be used as transports. In the GDW game, these were actually represented as transports. In the last post, I had said that these planes are, in fact, bombers, not transports. However, the rules state that these planes can be used as transports. With a range of 37 hexes, and being floatplanes, these could make all the difference in reinforcing Narvik. I just wish I had seen that rule sooner. 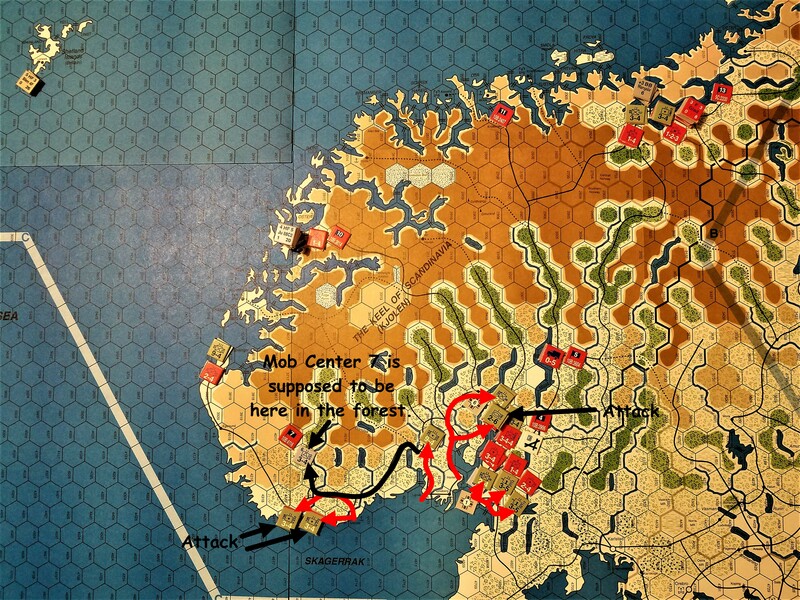 The Norwegian Army begins to mobilize, gaining 3 battalions, one each at Mob Center 4, 7 and 13. Unfortunately for the Norwegians, Mob Centers 4 & 7 have been captured, and so have those battalions. Most of the Norwegian reinforcements arrive near Trondheim and in the Arctic, but a cavalry unit arrive in Halden in southern Norway. Halden has been captured by the Germans but is not occupied. The rules are specific and clear. If a unit is scheduled to appear in a hex occupied by an enemy unit, it does not appear. Since Halden is captured, but not occupied, the unit can appear in the hex. That’s what I am going with, anyway. The British also send reinforcements, the aircraft carrier HMS Furious, with two Swordfish 1 air units, and the 24th Guards and 148th Brigades. The 148th lands at Namsos and establishes a supply base, while the 24th Guards, being the stronger of the two, lands at Andalsnes and also establishes a supply base. The AA Cruisers are reconfigured. Two are sent to protect the Furious, which is trying to stay out of bombing range, one is sent to Namsos and one is sent to Andalsnes to protect the supply bases. An AA battery is also landed at Namsos to protect the supply base. The cavalry unit in Halden moves west to recapture Mobilization Center #1 in Fredrikstad. 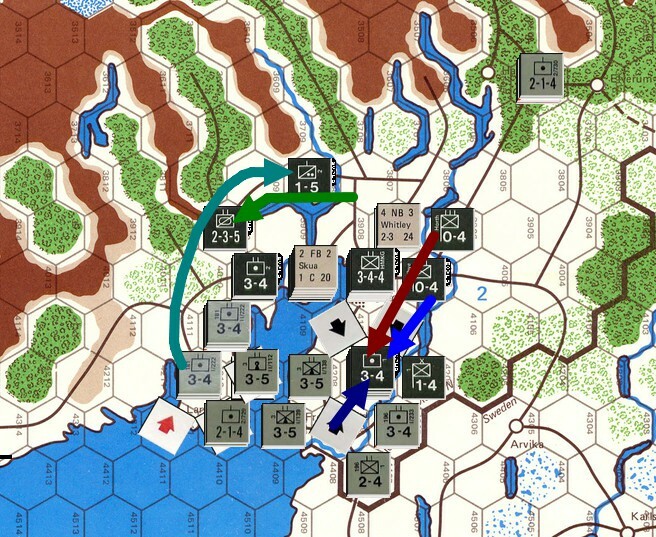 Forces in the Oslo area withdraw into Oslo, and the HQ units absorb the units in order to get as many in there as possible. While these forces could potentially push out through the 4-3-4 artillery battalion to the north quite easily, that would be giving Oslo up without a fight, and the Norwegians would be trapped in the open. The decision is made to hold fast, and make the capture of the city as costly to the Germans as possible, and delay them as long as possible. Around Trondheim, the Norwegians seal the area off to try to prevent a German breakout if supplies ever come. In the Arctic, the march towards Narvik continues. The battalion moving from the south is not going to reach the area until sometime around turn 11. The Norwegian 6th Brigade HQ begins to absorb units preparing for an attack on Narvik. The British fly night missions against Flatøy Air Station at Bergen again, scoring two hits on the airfield, and shutting it down. The Skuas from Sola strike, but are met by Me-110C and Ju-88C2 heavy fighters. Again, the Skuas prove to be too nimble for the German fighters, shooting down the Ju-88C2 heavy fighter in the process. Another victory point for the Allies. The Skuas also place another hit on Flatøy Air Station before returning to Hatston Field in Scotland. This is important, because it means that Flatøy is not just shut down for the next turn, but the turn after that as well. Airfields can only recover 1 hit per turn. 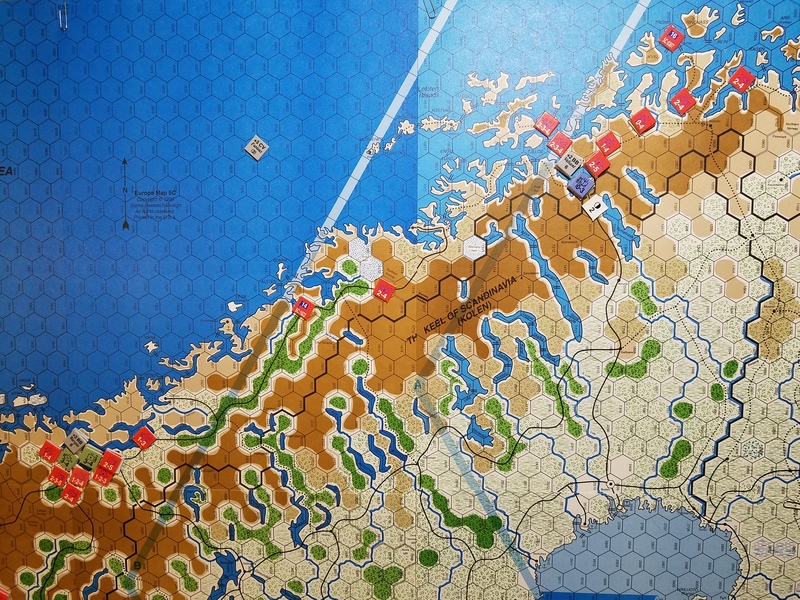 According to the rules as written, the Allies have now scored 119 victory points with the landings at Andalsnes and Namsos. I still think this is sloppy editing on the publisher’s part. I can understand 100 VPs if they are still in Namsos by the end of the game, but not handing out 100 victory points just because they landed there. To recap, southern Norway is almost overrun. Oslo is surrounded. The roads to Bergen and Trondheim are open. To be honest, I do not recall the Germans being this far along by this point of the game. Certainly the extra 7 battalion equivalents being shipped across the Skaggerak each turn is certainly helping. Below is a a picture from GDW’s Narvik (via Vassal), of the Oslofjord. Compare this picture, taken after the Allied movement phase during the Allied half of turn 2. 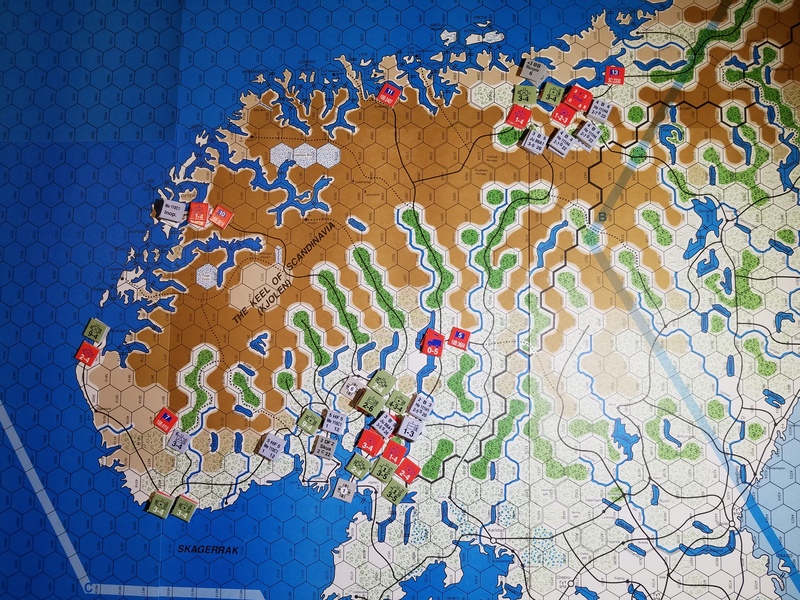 Notice that the Germans have no traction and are nowhere near Oslo at the same point of the game. It makes me want to throw the old one together after this and make a direct comparison. It’s good to see Narvik pulled out, especially the new edition! I know when I got SOS, I was so enamored of the EUROPA level systems and the potential for Sweden at War that i did not actually play the SOS:NARVIK game! (I did like putting the disruption on the flip side of the counters, such an elegant solution!) 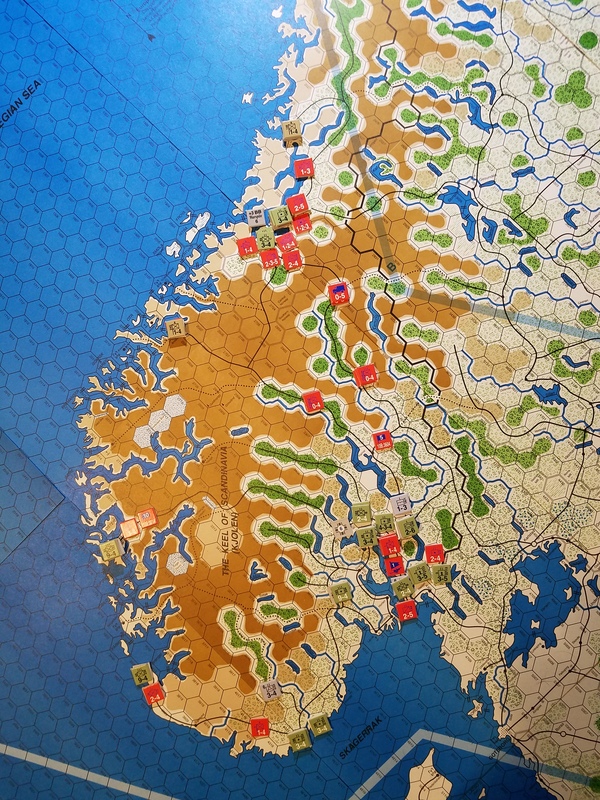 Amusingly, I was so enamored of the scenarios with Sweden at various levels of mobilization that I also never played the Invasion of Norway scenario at the EUROPA level!